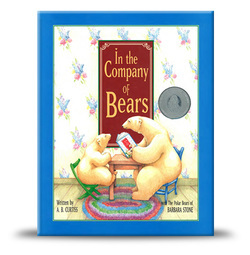 ​Winner of a Benjamin Franklin Award and a perennial teacher's favorite, In the Company of Bears has already won a place for itself in children's literature. Many call it a child's first book of philosophy. ​In this whimsical tale, wise and wonderful polar bears have discovered the secret of time, seeing all things exactly and precisely as they are: "To a BEAR, a kettle's a kettle. To a BEAR, a pot is a pot. Bears never call anything something that anything is not." The bears remind us of the beauty of simplicity and unhurriedness, and warn us that to reach any place worthwhile: 'You can't go by clock or by mile, you have to go by heart. And the path of the heart is the hardest to take for the heart will not fool and the heart will not fake." "I purchased two of your books: In the Company of Bears and Time of the Wild, which you graciously autographed for me. I have since read both the books a few times and wanted to express to you just how enjoyable I found them to be. I am especially fond of Time of the Wild! You have shared great wisdom to live by in both books and done so in absolutely beautiful prose. I will cherish these books and share your great insights with my friends and family. Thank you! Blessings, Constance Knapp"